Click the Find & Select icon in the Editing group. If you click the Replace tab, you can define the text or number to find and new text or numbers to replace it. Click in the Find What text box and type the text or number you want to find. If you click the Options button, the Find and Replace dialog box expands to provide additional options for searching, such as searching in the displayed sheet or the entire workbook. 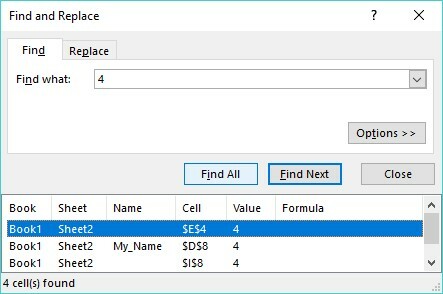 Find Next: Finds and selects the first cell, starting from the currently selected cell that contains the text you typed in Step 4. Find All: Finds and lists all cells that contain the text you typed in Step 4. The Find All button names all the cells that contain the text or number you want to find. Click Close to make the Find and Replace dialog box go away. Display formulas in your cells (instead of numbers). Highlight the cells that contain formulas. Press Ctrl+` (an accent grave character, which appears on the same key as the ~ sign, often to the left of the number 1 key near the top of a keyboard). Click the Formulas tab, and then click Show Formulas in the Formula Auditing group. This image shows what a spreadsheet looks like when formulas appear inside cells. By displaying formulas in cells, you can identify which cells display calculations. Excel highlights all the cells that contain formulas.